SPOTLIGHT ON…GABBY GARCIA’S ULTIMATE PLAYBOOK! OMG YOU GUYS!!! I just finished reading a book that is a MUST-READ for Dork Diaries fans!!! It’s called GABBY GARCIA’S ULTIMATE PLAYBOOK and it’s by an author named Iva-Marie Palmer. The book is written in a sort-of diary format. Technically it’s a “playbook” because Gabby is super into sports, so she’s thinking of it like a guide to achieving her dreams on and off the field. Like MY diaries, it’s got illustrations and doodles throughout. Gabby’s got crush problems AND friend problems AND fitting in problems. At the beginning, Gabby is sent to a brand new, fancy school—just like I was! If you’re like, “Cool Nikki, but I don’t like sports,” trust me: that doesn’t matter! I’m not sporty, but that really doesn’t matter. It’s not one of those sports books that spends most of the time describing every play in every game. It’s really about her LIFE and her DREAMS. And girl, Gabby knows what she wants and goes out and GETS IT. She makes some terrible choices and gets into hilarious messes along the way, and I can SO relate to that. 🙂 I totally admired her self-confidence and willingness to go after what she wants and I think I learned a couple things from Gabby. Also, her crush is SUPER SWOONY. 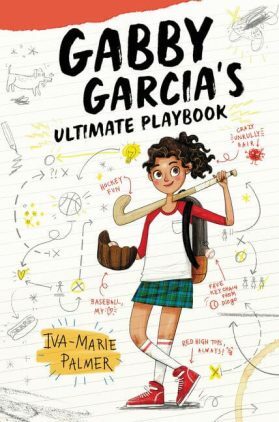 I was super excited to learn there’s a second book in the series, too: GABBY GARCIA’S ULTIMATE PLAYBOOK: MVP SUMMER. I can’t wait to read it!!! If life were a baseball game, all-star pitcher Gabby Garcia would be having her Best. Season. EVER! Until she’s suddenly sent to another school and her winning streak is about to disappear—both on and off the field. But Gabby never gives up! She has a PLAN to keep her champion status intact, and every step of it is written out—PLAY by PLAY. How could it not work? This new series written by Iva-Marie Palmer is filled with funny illustrations, sports facts, and blooper-reel moments that will have readers laughing and rooting for more. Has anyone read this book? Tell us about it in the comments! And if you haven’t read it, tell us about a book with a main character who’s going after what they want. I want to read it so badly!!! READ it. Did not like it.do not read it. That is just an opinion. You may think it’s bad, but that doesn’t mean others will think it’s bad. And to all the Dork Diaries fans out there, don’t worry. I used to think I don’t fit in when I hate something other people love, or when I love something other people hate. But I learned not to take it to heart. Even if you feel different about something, you should still be yourself no matter what, and don’t worry about what everyone else thinks of you. I really want to read this! A book that has a lead character that will never give up till she gets what she wants… hmmm… well, theres Gilly in Fairy Tale Reform School. She wants her siblings to be weel-fed and happy, even if it means that she has to steal. She gets sent to FTRS, where she meets Jax, Kayla, Maxine, Ollie, and her Mackenzie, Jocelyn. I don’t want to reveal the whole plot, but they’re basically trying to figure out how to save FTRS from Gottie, who turns out to be the person who cursed Princess Rose, all while trying not to get caught by Miri the magic mirror or Gottie’s gang of flesh-eating gargoyles. It’s a really good book, and I’d recomend it to those who are fans of Whatever After, Land of Stories, and even story Thieves! unfortunately, I do not have the book. But maybe I’ll get it!!! Thank for the suggestion, Nikki! I already bought this book and started to read it! I should read this. You can find it at Indigo/Chapters/Coles, right? OMG! I`m desprate to read that! OMG I have got to read that!!!!! Omg i read this book last year in 2017. !!!!!! Can’t believe they’re is another one! Thanks a lot. Nikki you inspire me so much . Thanks for recommending this book, it seem quite interesting in your view and I think it will be for others too. And OMG, am I excited for your new diary!! SQEE SQUAD!!! WHO ELSE? ?